Hurrah..! Blogger has introduced a SEO friendly feature-bloggers will love this. Yes, blogger introduced custom permalinks for blogger posts. Now you can use SEO friendly custom URL for blogger posts. What is the role of Permalink in SEO? 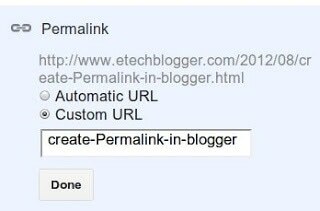 Permalink(permanent link) is the unique URL assigned to each of your blog posts. This URL is basically the link that visitors are using to share your articles to different social networking sites and community forums. Customizing your Permalink is very helpful for blogger’s SEO. As you can customize the url , you can use some top and seo-friendly keywords in the url instead of automatic url creation. So choosing the right keyword will get you in the top of google. Ok, let us see how to do this?! The procedure is very simple . Login in to your dashboard. Character limit: There is no limit in the number of characters used in the url. But try to use within 70 characters that will be SEO friendly. Don’t use conjunctions, prepositions and articles such as ‘to’,’from’,’and’,’at’,’from’,’in’.